Cannibalism among wild animals is not too unheard of but an extreme form is reported from Madhya Pradesh's Kanha reserve. A male tiger who is named as Bajrang has killed three other big cats. Wildlife experts have described it as a 'rare' case seen among the cannibalism of the wild cats. The tiger had also eaten some parts of the other tigers he killed. 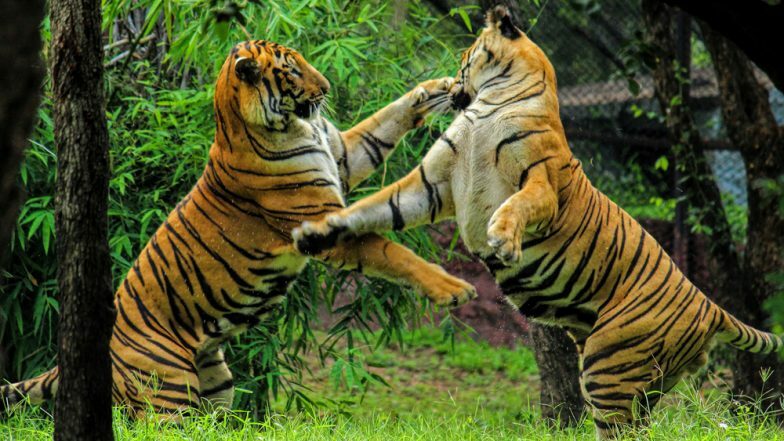 Tiger Kills Potential Sumatran Mate on First Date at London Zoo. Forest officials confirmed a male tiger in the Kanha National Park had killed two other sub-adults along with another tigress in the last one month. In a report to Hindustan Times, Kanha national park field director L Krishnamurthy was quoted, "The sub-adults who were about 2 to 2.5 years old were killed by tiger we have named Bajrang, who is around 6 to 7 years and the dominant male of the region. Bajrang was also responsible for killing a tigress on January 19 in the Mundidadar area of the park." A post-mortem was done on the remains of the sub-adult tigers. They could not do it for the other one because Bajrang was seen eating on the remains of that tiger when the officials found out. How to Attract Tigers? Indian Forest Officials Try Calvin Klein's Obsession Cologne Which Makes Wild Cats Go Crazy! Tigers do not really feast on their own members unless they are extremely hungry. Tiger expert and president of the Wildlife Conservation Trust, Anish Andheria said, "In most cases, tigers will avoid fighting and killing another tiger because they themselves might be injured in the attack, but they do so to protect their territory." Kanha has enough prey animals for tigers so the wild cats killing each other is worrying. Tigress Sundari Allegedly Kills a Man in Odisha, Later Attacks Journalist Who Went to Cover The Incident. A similar incident was reported from Sariska tiger reserve where a male tiger killed his three cubs. Although there is not evidence of this, deputy conservator of forest, Hemant Singh told HT, "We don’t have evidence of this , but the tigress’ behavior is an indication that she has lost her cubs and that the tiger has killed them." The exact cause of this rising cannibalism in the wild cats is still not known.